In 2016, I published an article on The Hidden Costs of Strategic Communications for the International Criminal Court. The article identifies the growing trend of publicizing Article 15 Communications (investigation requests submitted to the ICC Prosecutor). In the piece, I draw a parallel between this practice and that of strategic litigation, highlighting how highly-publicized requests are often geared not towards actually bringing about any ICC-related activity, but are instead used as a vehicle to call international attention to atrocities taking place around the globe. As set out in the article, it is unsurprising that this instrumental use of the Court’s Article 15 process has taken off; like their litigation counterparts, strategic communications can achieve important goals, such as educating the international community about gross human rights violations and mobilizing public opinion against harmful government policies. As the article also notes, these valuable benefits appear to have blinded both communication filers and court watchers to the fact that strategic communications also come with a price. At a minimum, the practice increases the number of investigation requests submitted to—and subsequently vetted by—the Office of the Prosecutor (568 between 2016 and 2017, and more than 12,500 since 2002), thereby creating additional work for an under-resourced arm of the Court. Also troubling for the Court is the fact that the publicity associated with the filings tends to create the misimpression that some type of ICC action is officially underway. As the article explores in depth, this can lead to a host of perception problems for the ICC when an actual investigation fails (for quite legitimate reasons) to materialize. Perhaps most troublesome is the cost that strategic communications can exact from victims who have, at times, been sold the false promise of recourse from the ICC, only to have been let down in the end. Notably, recent developments in US jurisprudence have revealed a new—and tangible—cost associated with the filing of all Article 15 communications (not just those of the strategic variety). In 2017, the filers of a Article 15 communication sought to use 28 § USC 1782—which authorizes the use of US district courts to obtain discovery for use in foreign proceedings—to obtain evidence “critical to the ICC proceeding.” The application was initially granted despite there being no evidence that the ICC Prosecutor had opened a formal investigation (according to existing case-law, “1782(a) does not limit the provision of judicial assistance to `pending’ adjudicative proceedings”). While this development seems like an argument in favor of filing Article 15 communications, the matter didn’t end there. Instead, the target of the application (Chevron) moved to vacate the order, arguing that the American Service-Members’ Protection Act (ASPA) bars the use of section 1782 to obtain discovery for use in connection with ICC proceedings. This Act, it may be recalled, prohibits US cooperation with the ICC, including support from US courts. Ultimately, the parties to the Chevron matter filed a joint stipulation resolving their discovery dispute, but the developments in the case highlight a previously masked cost of Article 15 communications, and yet another reason for lawyers and non-governmental organizations to proceed with caution before submitting an investigation request to the ICC Prosecutor. Going forward, would-be filers should carefully assess whether their intended Article 15 communication might later be invoked to prevent victim access to evidence in the US. Remarkably, Facebook has already tried to take a page out of Chevron’s playbook, maintaining that a recent application aimed at it was “an obvious attempt to evade federal law by obtaining discovery that may be used in support of ICC proceedings.” The link Facebook tried to make between the request and an existing Article 15 communication was tenuous, and the argument was ultimately disregarded by the Magistrate Judge (who described the allegation as “sinister,” “speculative” and “unsubstantiated”). Nevertheless, Facebook’s quick use of the arguments from the Chevron matter suggests that one must expect similar—and possibly stronger—arguments by the targets of 1782 applications in future. Incidentally, it was in preparing to participate at the recent ICC Scholars Forum in The Hague that I came across these recent developments. I’m delighted to have been a part of this incredibly productive conference, which was organized by fellow IntLawGrrls Leila Sadat and Larissa van den Herik, along with Leiden University’s Sergey Vasiliev. At the event, I had the pleasure of commenting on Emma Irving’s important and timely research on the removal of information from social media platforms and consequent access issues for the ICC. Delighted to return to Intlawgrrls, and to have recently attended a fascinating program on International Criminal Law in a Retreating World organized by the American Bar Association’s International Criminal Court Project, Center for Human Rights, and Criminal Justice Section. The program included a variety of perspectives presented throughout the course of two back-to-back panels. The first panel—US Policy on the ICC and International Criminal Justice—featured Former Legal Adviser to the Department of State John Bellinger, Global Justice Center President Janet Benshoof and Stephen Lamony, Senior Advocate for Africa with Amnesty International. The second panel featured the current Prosecutor of the International Criminal Court, Fatou Bensouda, and former Ambassador At-Large for War Crimes Issues, Professor David Scheffer. Much of the conversation in the first session revolved around the anticipated deterioration in the US-ICC relationship after a longstanding policy of constructive engagement that began during George W. Bush’s second term and continued to advance under President Obama. For Benshoof, the proper way forward for Court proponents in the face of this expected hostility is to advocate zealously for a yet stronger association with the Court, including a push for the present administration to accede to the Rome Statute. Bellinger, however, cautioned against what he described as “waving a red flag,” a reasonable concern in light of the present “onslaught on international law and institutions.” In Bellinger’s self-described pragmatic view, Court supporters should instead emphasize widely the commonalities of the U.S. and the ICC, including a shared commitment to hold perpetrators of atrocities accountable. How those who don’t remember history are doomed to repeat it: One of the key takeaways from Bellinger’s contributions is that ICC advocates need to educate the current administration about the prior missteps in the US-ICC relationship. Citing to such gaffes as the decision to cut off military aid to foreign governments that refused to sign Article 98 agreements—a move famously described by then-Secretary of State Condoleeza Rice as “sort of the same shooting ourselves in the foot” because it undermined efforts to combat terrorism and drug trafficking—Bellinger repeatedly highlighted the need to avoid “roll back” to this earlier state of hostility and opposition. The “pivot” in the US-ICC relationship after Bush’s first term: For this author, who has long scrutinized the relationship between the US and the ICC, one of the most interesting revelations of the day came in response to a question about what prompted the dramatic shift in the US approach to the Court in Bush’s second term. According to Bellinger, it was the world view of US opposition to the Court that triggered the shift. Apparently, so many world leaders voiced their concern about the US position to former President Bush that he asked for a paper on the value of the Court. The rest, as they say, is history. The ICC Prosecutor’s current investigation of US forces in Afghanistan: Since 2007, the ICC Prosecutor has been conducting a preliminary investigation into Court crimes allegedly committed on the territory of Afghanistan. As a result of this inquiry, the Prosecutor recently declared that there was a reasonable basis to believe that US military forces deployed to the country committed war crimes of torture and related ill treatment. What happens next depends in part upon whether the Prosecutor seeks to go forward with a formal investigation. Not surprisingly, Bellinger noted that if an investigation involving US troops were to materialize, this would put a decisive end to any prospect of US cooperation with the Court. The status of the Afghanistan investigation was again raised in the second panel discussion. Prosecutor Bensouda recognized that many were eager to learn whether she would request authorization from the Pre-Trial Chamber to proceed to a formal investigation into the matter, a requirement for the inquiry to advance under Article 15 of the Rome Statute. She also acknowledged that this widespread interest was the natural result of her November 2016 declaration that her decision on the future of the investigation would be announced “imminently.” As for the delay, Prosecutor Bensouda explained that, since her announcement, there has been “more engagement” with interested states and that this engagement has produced additional information that she is statutorily required to consider before proceeding further. Presumably, the Prosecutor was referring Article 53, a provision that obliges her to consider whether the interests of justice would not be served by initiating a formal investigation, as well as whether insufficient gravity or the principle of complementarity would render the case inadmissible. Although (unfortunately) she provided no insight as to which of these considerations was implicated by the recent state engagement, complementarity seems the most likely possibility. Under that principle, a case is inadmissible if a state with jurisdiction is conducting its own, genuine investigation into the matter. Accordingly, it might well be that the Prosecutor’s recent announcement actually prompted a state to fulfill its obligation “to exercise its criminal jurisdiction over those responsible for international crimes.” If so, this would be a major win for the Court, which is meant to be an institution of last resort, stepping in only when states have failed to deal appropriately with international crimes. That said, Bensouda acknowledged that the Court is facing no shortage of problems at the moment. Among them, she described state cooperation as a “huge challenge” and noted the Court’s ongoing difficulties with witness interference. Professor Scheffer similarly noted a series of setbacks for international criminal justice, and argued that part of the problem lies in the unrealistic expectation that international criminal law should change the world when, really, this is the bailiwick of politics. Scheffer also credited contemporary international criminal justice efforts for the fact that “the presumption of impunity is now dead” and argued that the international criminal institutions require patience and continual governmental support. This author is looking forward to discussing many of the issues raised by the five experts at the International Criminal Court Summer School in Galway, Ireland, where she will be lecturing in June. The upcoming course, offered by the Irish Centre for Human Rights boasts a distinguished list of speakers, including fellow Intlawgrrls Nadia Bernaz and Noelle Quenivet. Delighted to return to intlawgrrls, and to have attended the June 10 briefing on the International Criminal Court (ICC) delivered by U.S Ambassador-at-Large, Stephen J. Rapp,(photo, left) head of the Office of Global Justice in the U.S. Department of State and hosted by the Washington Working Group on the International Criminal Court (WICC) and the Tom Lantos Human Rights Commission of the U.S. House of Representatives. Those present heard an up-to-date perspective on the ICC, including its relationship with the United States, moderated by Christopher “Kip” Hale, Senior Counsel for the American Bar Association and Director of the ABA’s International Criminal Court Project. 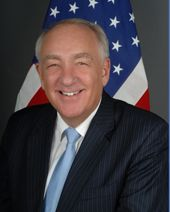 Ambassador Rapp set the stage for his briefing by discussing the global leadership of the United States in the field of international criminal justice, beginning with the Nuremberg proceedings and continuing through to the work of the International Criminal Tribunals for the former Yugoslavia and Rwanda. He followed with an extensive and detailed discussion of the work of the Court to date, along with an incisive analysis of the evolving role played by the United States over the course of the ICC’s development. The ways in which ICC practice and US policy are aligned: The clear preference of the United States is to see justice performed at the national level. This position, Rapp emphasized, is consistent with the Court’s principle of complementarity. Under each approach, the priority is for cases to be prosecuted at the national level unless nations lack the will or capacity for domestic prosecutions. The benefits of engaging with the ICC: Rapp highlighted that the current policy of constructive engagement ensures that U.S. interests and perspectives are well-represented as the Court goes forward. To place the importance of this positioning in perspective, Rapp noted that a number of Court’s developments—particularly those related to the crime of aggression—might have gone differently, and perhaps preferably, had the United States been a part of the ICC conversation from 2002-2008. The need to structure engagement with the Court within the confines of existing laws: Federal law presently prohibits direct financial support to the ICC. Thus, Rapp discussed alternative means of US assistance including the U.S. Rewards for Justice Program which, with bipartisan backing, was recently expanded to include support for the apprehension of individuals wanted by the ICC. The salutary benefits of the ABA’s ICC project: Federal law also limits U.S. non-monetary assistance to specific ICC cases, precluding the United States from acting in ways designed to benefit the Court as a whole. Rapp lauded the ABA’s ICC Project for filling this void. Promoting practitioner engagement and training is one of the three pillars of the ABA project, which aims to unite ICC lawyers and staff with their domestic counterparts, enhancing investigation and advocacy skills through such vehicles as best practices conferences and training workshops. The overall tenor of the briefing was markedly positive. Noting the U.S. commitment to hold perpetrators of atrocities accountable, Rapp reasoned that the United States ought to do what it can to assist the Court in bringing alleged war criminals to justice. When I asked Rapp to identify what, in his view, was the most significant impediment to the United States joining the ICC, he first acknowledged that U.S. ratification of international treaties has historically been a lengthy process. Rapp noted, however, that before moving in this direction, the United States would have to overcome its concern that the Court might be used unfairly against it. In Rapp’s view, this process will require more time for the United States to assess how prosecutors act and how ICC judges decide admissibility standards, in order to establish confidence that the U.S. would not be unfairly targeted by the Court. This author is looking forward to discussing Rapp’s briefing next week at the International Criminal Court Summer School in Galway, Ireland, where she will be lecturing on the U.S. and the ICC. The upcoming course, offered by the Irish Centre for Human Rights boasts a distinguished list of speakers, including the founding Director and now Honorary Chairman of the Centre, Professor William A. Schabas, fellow intlawgrrl, Nadia Bernaz, numerous ICC insiders and Don Ferencz, executive director of the Planethood Foundation and member of the Board of Advisors on the ABA-ICC Project. A video-recording of the briefing is available here.